Traditional painting wisdom dictates that we should work all over the entire composition at the same rate of speed, so that at any point in time, our creation might look complete to an outside viewer – and better yet, giving us the option to stop at any point along the way. In oil painting, there are additional important technical reasons why this is a sound approach. Not every artist works in this manner, of course, and the method doesn’t necessarily work with all media. The way I would answer the question of how I know that I am finished is when my vision for a piece of art is fulfilled. Not every work ends up looking exactly like it did in my head when it was just an idea; after all, someone originated the saying, “The best things in art happen by accident.” But depending on the size or complexity of a work, I tend to have a mental or physical checklist of what remains to be addressed before I consider a piece to be completed. Once I mark the items off that to-do list and am pleased with the way that the individual compositional components are working as a whole, I am finished. 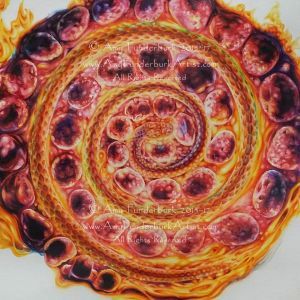 During my Spring Subscribers’ Studio Soirée, visitors saw the completed version of my first interactive meditative watercolor, Blue Moon Fire Spiral. However, I am living with it for awhile before I show everyone the entire work. Watercolor is an exacting task master, so if there is an aspect that does not turn out to match your original intentions, it is not as forgiving as oil. I may decide to alter a particular aspect of this piece – we shall see. After all, we are talking about a painting that, early in its development, I purposefully burned off the bottom edges of the paper! As soon as I am decisively satisfied with it, I will present it here and in my newsletter. In the meantime, I have included a detail of the main action to tantalize you! I really like how this central area takes on a vortex-like depth if you let your eye travel the curve of the snake to the center, as you would a mandala. Studies for The Bird’s Nest Mudras triptych, in progress. My longtime newsletter subscribers may recall that I have been exploring various oil application techniques in order to increase the speed of my painting time while still achieving a similar final appearance. 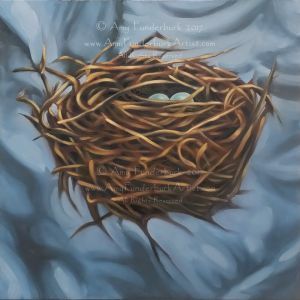 To this end, I have enjoyed working on some studies of three bird’s nests specifically in preparation for an upcoming triptych. This process has been very educational, and I now feel that I have a good direction in which to head by using a version of the indirect painting method. For non-painters, this means applying a layer of paint to a previous dry layer, rather than working wet-in-wet. 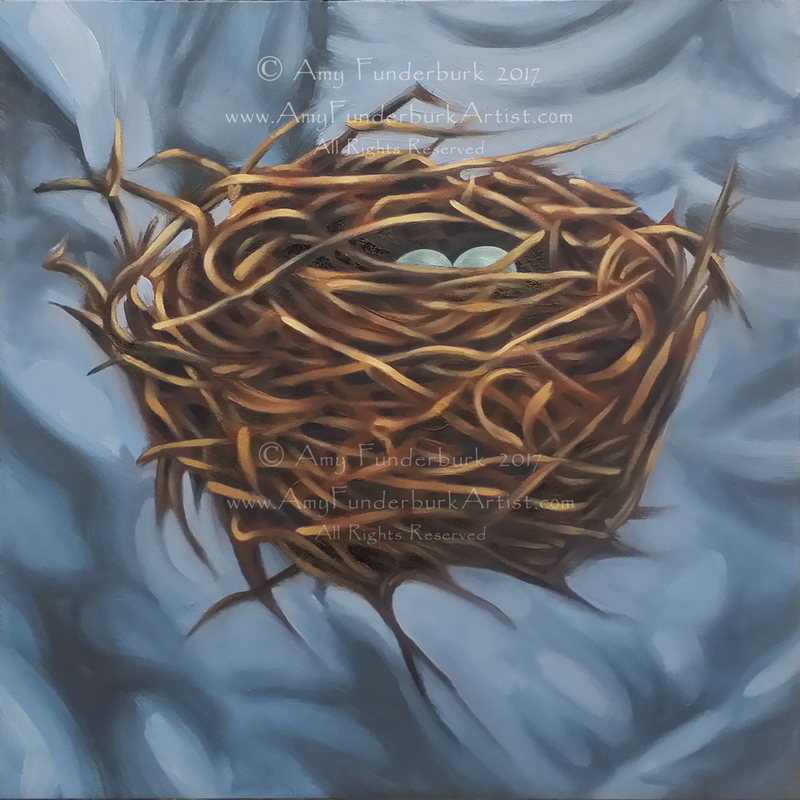 In the first panel, Nest Study #1: The Floating Nest, I employed an approach very similar to what I have traditionally used. I started by wiping out the highlights from a wet underpainting. I followed this step by applying a wet-in-wet layer with several values, and then once that was dry, I worked on top with subsequent layers — though, since this is a study, not to the level of detail to which I would ordinarily go. Nest Study #2: The Vortex Nest is a hybrid of sorts, while with Nest Study #3: The Tangled Nest, I employed a more purely indirect technique by layering thin, translucent glazes and scumbles on top of a dry initial layer of flatter, local color. 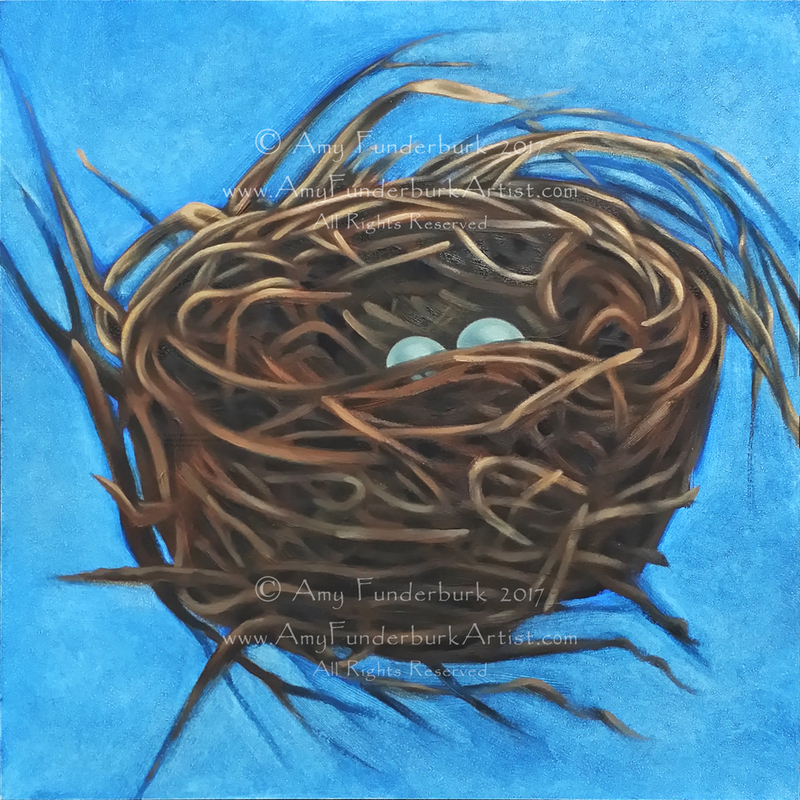 Each little nest and their respective eggs now only lack some highlights and simple background information. 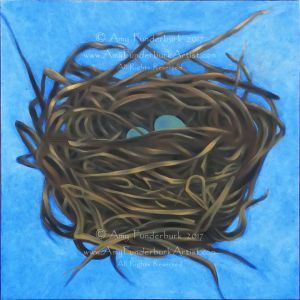 The cobalt blue you still see in the backgrounds of Nest Study #2 and #3 is still the original underpainting. You can get a good sense of how I am building lights on the darker values in Nest Study #2: The Vortex Nest — I have finished the top portion with highlights, but have not yet addressed the closer rim of the nest. As you can see above, I have not yet applied any of the lightest lights to Nest Study #3: The Tangled Nest. 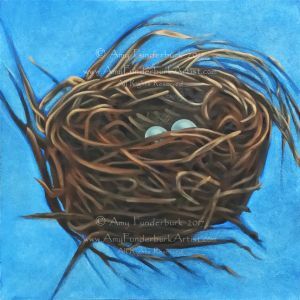 You can view three of the colors of my Nests palette with the last article below. The recipe for your style and creative practice tends to just evolve organically as you continually add items from your growing artistic experiential buffet. It is very interesting to step back and purposefully recalculate your route so as to navigate a different path to reach your desired destination! To stretch yourself in this way, or through a residency or workshop, keeps your practice fresh and keeps you growing as an artist. Get out of your comfort zone: explore, examine, and experience. Once they are completed and have informed my approach for the final triptych, these studies will be framed and available for purchase. Please contact me for further information. To see other in-progress images of these studies and Blue Moon Fire Spiral, please visit my Works in Progress gallery. This entry was posted in Creativity, General art discussion and philosophy, Meditation and yoga, Painting and painting techniques, Works in progress and tagged bird's nest, mandala, meditation, meditative, mudra, mudras, nests, oil oils, painting, snake, watercolor, watercolour, WIP.